As July ends Earth approaches the Perseid meteoriod stream. That sounds rather complicated but its not. A meteoriod stream is somewhat like a jet contrail. With the right conditions a jet leaves a trail of water vapor behind, the trailing cloud. A comet flies through the solar system and leaves a trail of dust behind. 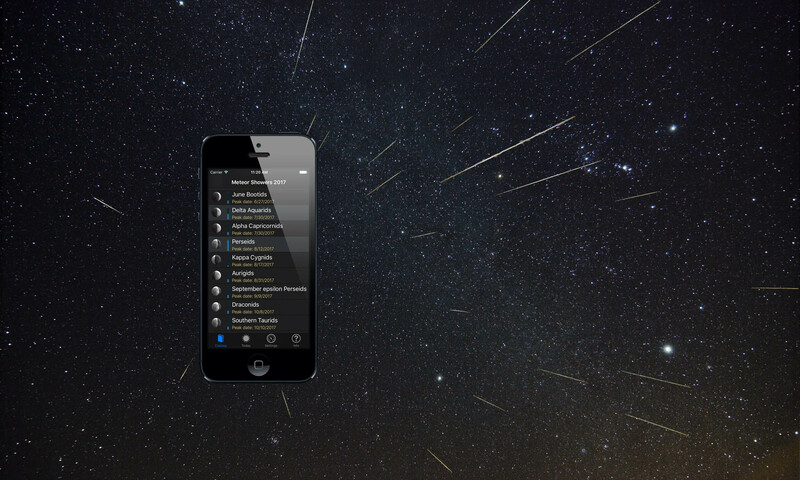 The Perseids meteor shower has been around a long time so its spread out a bit in space. We are already encountering parts of it but the big show is still days away. Every day the Earth gets closer to the densest portion of the stream. The timing is pretty good this year with the moon being past last quarter and for us in the Central timezone the shower peaks in the morning. This year the peak day occurs on a weekend so there is no excuse not to get out to a dark location and enjoy a centuries old show. App Update: Sven reported a bug when setting the longitude manually. Oops! Clearly I missed testing any east longitudes. I’ve got a fix submitted for review and it should be out in a few days.